In my last blog post, I spoke about joy. In that post, I said, “We feel safe, cherished, fortunate and vibrantly alive when we are joyful. However, that exuberance is often associated most with children, and is something we are encouraged to put away when we ‘grow up’.” I also suggested you might like to “Dance. Run. Play. Splash paint. Sing. Jump in puddles.” I believe that joy and creativity are strongly linked, especially in childhood. 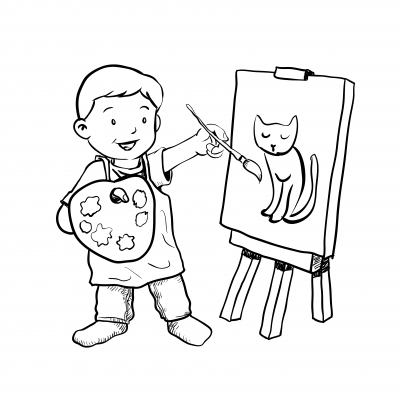 That children are vibrantly, joyfully creative and gain much from this self-expression. That adults often see themselves as “not creative”, no matter how much they might have been as a child. What happens between childhood and adulthood to cause such a change? In many cases, it seems that the Inner Critic developed as our creative expression was judged by those around us – both formally (such as in school) and informally (by peers, family and even strangers on social media). We are also fed a narrow range of what “creativity” means – usually limited to specific arts and musical endeavours, and specific ‘standards’ in those things. However, I think creativity can be so much more than that. Do you enjoy putting specific outfits together in harmonious colours? Or applying fun makeup? That’s creative. Are you good at baking? Or putting together meal plans and using or making recipes? That’s creative. Do you daydream about people, places, situations and imagine what might happen? That’s creative! The Inner Critic might be dismissing this, finding some reason it ‘doesn’t count’ when you do those things. You might think that your work isn’t as good as someone else’s, or see flaws that spoil it for you. Your Inner Critic is trying to protect you from deeper fears – maybe failure, shame or embarrassment. It is hard to indulge your creativity when you don’t know what the result will be! If you can view your Inner Critic more compassionately in this way, rather than fighting with it, you may find it much easier to stop it holding you back. So, what if your creativity is still blocked? Fortunately, there are a number of ways you might work through it. 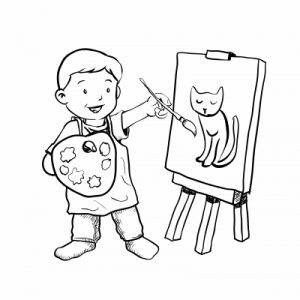 Various artistic hobby groups and classes are available both online and locally. Take time to find a space you feel safe and welcomed in, where you feel supported and free to let those creative juices flow. If you would rather try alone, then you might like a self-paced course such as The Artists’ Way, Mindful Art Studio classes, or one of the free courses listed here. You may find it hard at first to get going, and you may struggle to see ‘improvement’. However, if you can let go of your idea of the ‘perfect result’ and instead be in the moment with the process, you may not only enjoy things a lot more but also end up going off in unexpected and exciting directions! Plus, it is worth remembering that being bad at something is the first step towards being good at it! What will you discover in your creative journey? Please note, I have no commercial links or affiliations with the classes I have linked to – they are simply things that I have enjoyed myself. The Poisoned Parrot is a metaphor used to describe those nagging criticisms that pop into your head during the day – the “negative self-talk”. The Poisoned Parrot repeats itself over and over again. It is a bully that criticises your every move and never offers praise. In fact, even doing something really well just gives the parrot the opportunity to pick up on a tiny thing that wasn’t perfect. The Poisoned Parrot doesn’t accept that you are a human being and make mistakes. The nagging nature of The Poisoned Parrot can grind you down, and it is very hard not to believe what it says. If you’ve heard these things from your Poisoned Parrot, you are not alone! The Poisoned Parrot is very common – but not much talked about so we don’t see that other people have their own Poisoned Parrot acting like a bully to them. Would you put up with anyone else speaking to you this way? If not, why do you accept it from yourself? If you would, don’t you think you deserve better? Would you speak to a friend like that? Half the battle is in recognising your Poisoned Parrot and what it is saying. What might happen if you ignored it? Remind yourself of the evidence the Poisoned Parrot is wrong (a “success journal” could help here). Then go and do the thing anyway. Put the cover on the Parrot’s cage and do something more interesting and useful for you. The Poisoned Pet is a rubbish pet. You have no obligation to keep it around. If you are struggling with your Poisoned Parrot, please contact me to arrange an appointment. With thanks to the GetSelfHelp website for explaining the Poisoned Parrot here. There is more about the Poisoned Parrot and how to combat it here. I have found blog posts here and here about people’s experience with The Poisoned Parrot.